10 October 2016 – Announcing the launch today of a new platform for scaling up innovative finance solutions to support the achievement of the Sustainable Development Goals (SDGs) by 2030, United Nations Secretary-General Ban Ki-moon said the initiative can help in identifying and piloting innovative finance instruments that can drive investment and support well thought-out SDG interventions. “Financial actors and institutions are already beginning to develop solutions for attracting private capital in support of the 2030 Agenda [for Sustainable Development],” Mr. Ban told a meeting with high-level officials from Ministries of finance and foreign affairs, together with leaders from major global financial institutions at UN Headquarters today. Titled 'Financial solutions for the Sustainable Development Goals (SDGs),' the gathering showcased the initiatives and examples from around the world on how best business and the financial services sector can engage in the SDG process and transform markets. Mr. Ban said that the proposed multi-stakeholder Financial Innovation Platform would support the identification and piloting of innovative finance instruments, and would engage key development actors, including Governments, civil society, philanthropic organizations, entrepreneurs, institutional investors, banks, project developers and development finance institutions. Mr. Ban, who will step down as the top UN official when his tenure ends on 31 December, expressed hope that the Platform will provide the best possible know-how to support the efforts by the incoming Secretary-General. “Sustainability and stability of the financial system are mutually reinforcing,” he said, emphasizing the importance of reorienting existing financial flows to sustainable objectives so that investors will reap the benefits in the form of secure markets and thriving consumers. That is why Governments, gathering in Addis Ababa in July 2015, adopted an an action agenda aimed at creating policy and regulatory environments that provide incentives for long-term and sustainable investments, he added. According to Mr. Ban, the financial sector, spearheaded by companies such as Aviva, is promoting the creation of international benchmarks while the World Bank Treasury Office is issuing innovative financial instruments that are generating new investment opportunities. Efforts are now needed to build on these initiatives, and the United Nations can play “a catalytic role” and intends to create a venue where leaders from all sectors, including government, can join forces, learn from each other and align their actions for greater collective effect, the Secretary-General said. Many new ideas and solutions are already in play. International Housing Solutions, a global private equity investor, is using both catalytic and commercial capital investors to make green homes affordable to a wide population in Sub-Saharan Africa. CEO Michael Falcone said at the meeting that the creation of a UN platform will help to expand affordable green homes across the region. “We are engaged in nothing less than the transformation of global capital markets,” said Mark Wilson, Group CEO of Aviva, an international insurance and investment company. “That demands major change. “If business isn't sustainable then society is at risk and if society isn't sustainable then business is at risk. 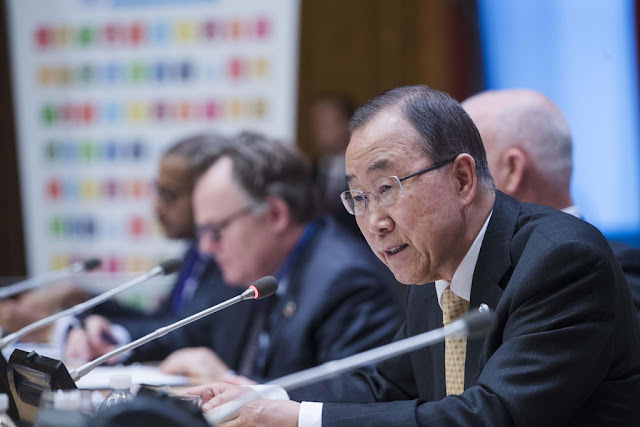 So it's just enlightened self-interest for business to support the SDGs,” he said. "While there are many pathways forward to achieve the SDGs, one thing is clear: business as usual is not an option to close the $2.5 trillion annual funding gap in developing countries alone," said Judith Rodin, President, The Rockefeller Foundation. "To realize the SDGs we need to foster a new era of collaboration and coordination, and the UN Secretary-General has unprecedented convening power to do this by bringing together leaders from different sectors,” she stressed. The concept of a new multi-stakeholder forum to help finance progress on the Goals emerged following the 2015 Financing for Development Conference that took place in Addis Ababa, Ethiopia. At that Conference, world leaders called for creative and innovative solutions by the private sector to scale-up investments in activities that contribute to the sustainable development. It is now clear to many in the finance sector, that there are new demands of the marketplace as well as shareholders seeking sustainable investments. This is why a new framework for sustainable investing is needed. The know-how that is being made available within the finance sector will be shared and made accessible: the platform will accelerate solutions and encourage scale up. For more information and to receive regular updates about the United Nations and the Sustainable Development Goals please subscribe to my personal Google News feed or you can subscribe to Globcal International's United Nations SDGs official syndicated feed.